As a healer, I can only go so far in liberating myself from pain caused by stuck emotion. Although it had been quite a long time since Christian and I had last seen eachother, he was the only practitioner that came to my mind to call for help when I found myself suffering from unearthed grief – that resulted in deep neck pain, back pain and nausea. I knew that with Christian’s keen, non-judgmental sensitivity and skill, I would be held in a safe, compassionate “container” in which to wail, cry, stretch – do whatever I needed to move this blocked energy. The session was nurturing and nourishing – and accomplished what I had intuitively believed. 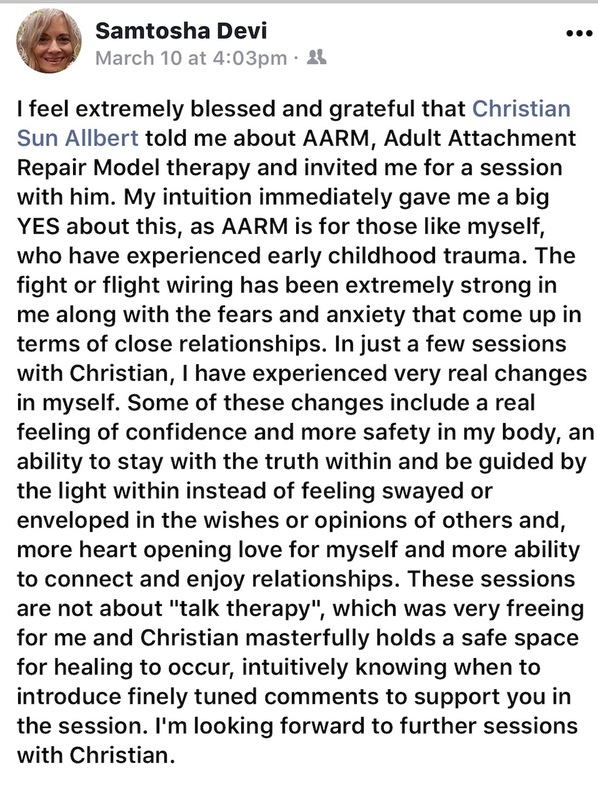 Christian is experienced, observant, open and highly intuitive. He has the strength , compassion and control to really “get in there” and eradicate ancient patterns while demonstrating sensitivity to the most subtle energy flows. I recommend him highly … Kent P. Mesplay Ph.D. In my opinion, this type of work is amazing and would benefit all individuals who present themselves as Open, Honest, Loving, and Willing. I am still experiencing profound understanding from this experience and it has helped me to let go of addictions after a recent breakup with my partner/lover ( a few days before). by Trevor Ryan Hughes Get the whole story at… http://wakingwithin.blogspot.com/ Yoga Therapist, Alchemist, Director For Waking Within Co.
Christian has been serving sandiego and worldwide for over 20yrs. As a healer, I can only go so far in liberating myself from pain caused by stuck emotion. Although it had been quite a long time since Christiaan and I had last seen eachother, he was the only practitioner that came to my mind to call for help when I found myself suffering from unearthed grief – that resulted in deep neck pain, back pain and nausea. I knew that with Christiaan’s keen, non-judgmental sensitivity and skill, I would be held in a safe, compassionate “container” in which to wail, cry, stretch – do whatever I needed to move this blocked energy. The session was nurturing and nourishing – and accomplished what I had intuitively believed. Since then, the transformation in my sense of well-being keeps accelerating! I feel lighter, clearer, more empowered and alert – and filled with gratitude! 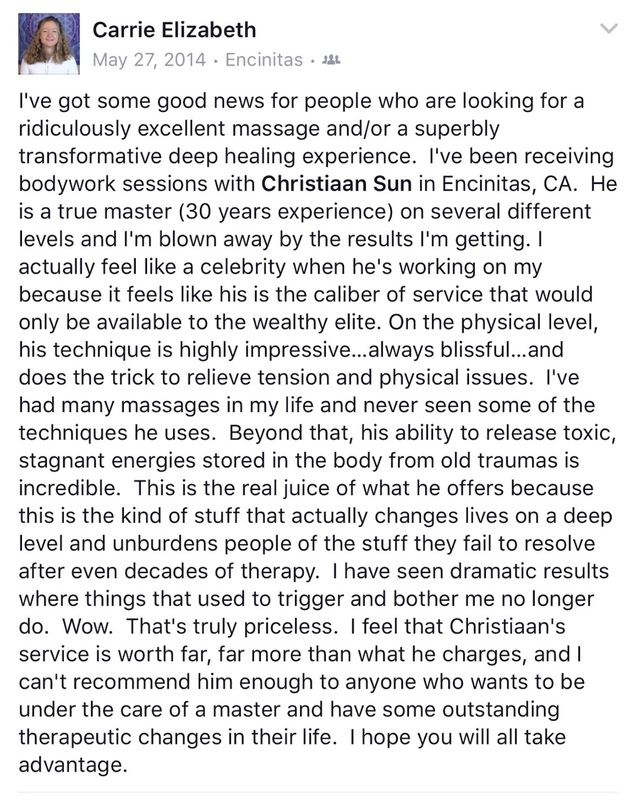 Christiaan is a gifted healing presence to be sought out without hesitation. 🙂 !